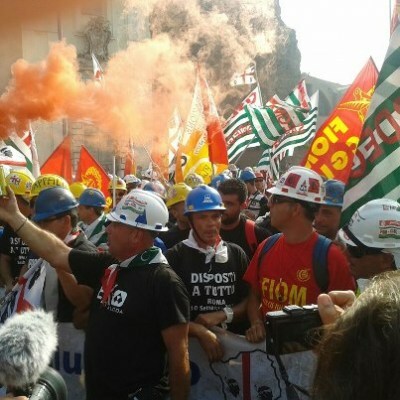 As unemployment rate continues to increase and social discontent mounts, unpaid layoff workers of different sectors protest in Rome, in Sardinia and in Naples on September 10. It’s been an ordinary day in a country where unemployment has risen to 10,7% and is growing faster than in the rest of EU. On September 8th, Alcoa workers came to Rome, to get a solution for the “impossible case” (this is how Minister Corrado Passera defined it just few days ago) of their plant. During the last week, when the protest reached a new peak , many important newspapers and tv has described the workers as potential terrorists, a threat to social peace. Rome was locked down, with around one thousand policemen protecting the “red zone” (an area in which you cannot protest) from a few hundred workers. And while police were trying – violently – to stop them from getting close to the Ministry for Economic Development, inside the institutional building the future of their plant was discussed. No definitive solution had come out to save the Porto Vesme factory from being dismantled, but Alcoa has committed to delaying switching off the plant’s machinery (which must remain in use constantly and once turned off cannot be used again without huge costs). The two Swiss multinationals that have shown interest in its acquisition ask for the price of energy to fall and, in one case, for the reduction of the number of employees. The two companies, the government said, will be convened “soon”, to check the advancement of the negotiation and to help them to get over any hurdles. The government also stated that they will pay out the redundancy payment to the workers of Alcoa’s satellite industries. During the demonstration, the workers pushed away Stefano Fassina, the person in charge of economy and work for the Democratic Party. Fassina has received the solidarity of many political forces, but what is certain is that the Democratic Party has been far removed from workers struggles from too long, and has no credibility left among workers. But there were not just Alcoa workers protesting yesterday. Once again in Sardinia, two Vinyls workers climbed on an inactive torch in Porto Torres petrochemical plant, 100 meters high. Vinyls workers occupied the island of Asinara for an entire year to claim a future. Yesterday there should have been an important step towards its acquisition by a Brazilian company, but the commissioners that are in charge of the sale stated that there is no news. Since June Vinyls workers have stopped receiving the redundancy payment and the new buyer is their only possibility at the moment. The Vinyls industrial dispute will be on the government table in the next days. Coming out of Sardinia’s situation, another protest took place, this time in Naples. The workers of Astir, a company dealing in environmental clearance owned by the Region of Campania, climbed on Maschio Angioino’s arch and got undressed to draw the attention to their problem. The company has been put into liquidation and workers haven’t received their salaries for six months. The regional government doesn’t respond to their many protests, and yesterday their industrial dispute was on the ministerial table too. Together with another 150 disputes that are open at the Ministry of the Economic Development, regarding 180,000 workers.